If you’re looking to build a closet full of clothes that go well with each other and will look great in a variety of situations, you may be tempted to go with black, over and over. After all, everything goes with black, right? Sure, but that gets repetitive and can lack a mark of personal style. To add a little more of that “je ne sais quoi” to your wardrobe without sacrificing ease, I recommend adding grays and blues. The spectrum of grays and blues are basic neutrals that can be matched with a variety of colored shirts, ties, and shoes and are versatile enough to be appropriate for almost any situation. These colors are both strong enough to be formal and soft enough to be dressed down for a more business casual look. Maybe you’ve already started down the “but-everything-goes-with-black road,” try imagining that these blues and grays are your black pieces and match them with the same accessories and shirts you would have picked out. Doing this, you will easily create a more unique and personal style. If you’re still unsure, contact me, your personal J.Hilburn stylist, for advice. Gray suit, tattersall shirt, blue tie, brown shoes. Navy jacket, gray shirt, navy chinos, brown shoes. Gray jacket, white shirt, dark denim, gray shoes. Navy jacket, white shirt, gray chinos, gray shoes. Gray jacket, blue shirt, gray chinos, brown shoes. Gray jacket, white shirt, gray chinos, gray shoes. The options are basically limitless, and you can consider changing the color of the shirt or adding a pop of color in the tie, socks, or pocket square to almost any of these options! Remember, dark denim is a blue and we know that jeans go with everything. Look at your navy jackets and slacks the same way. And, you can wear a navy jacket with a navy chino, unlike the denim equivalents. Let me just add, I love black too. It’s a great color for so many reasons and there are situations where it just makes sense to wear black. However, adding blues and grays to your wardrobe will ultimately up your style game, increase the variety of looks you can create, and provide you with more simple go-to’s for your everyday life. 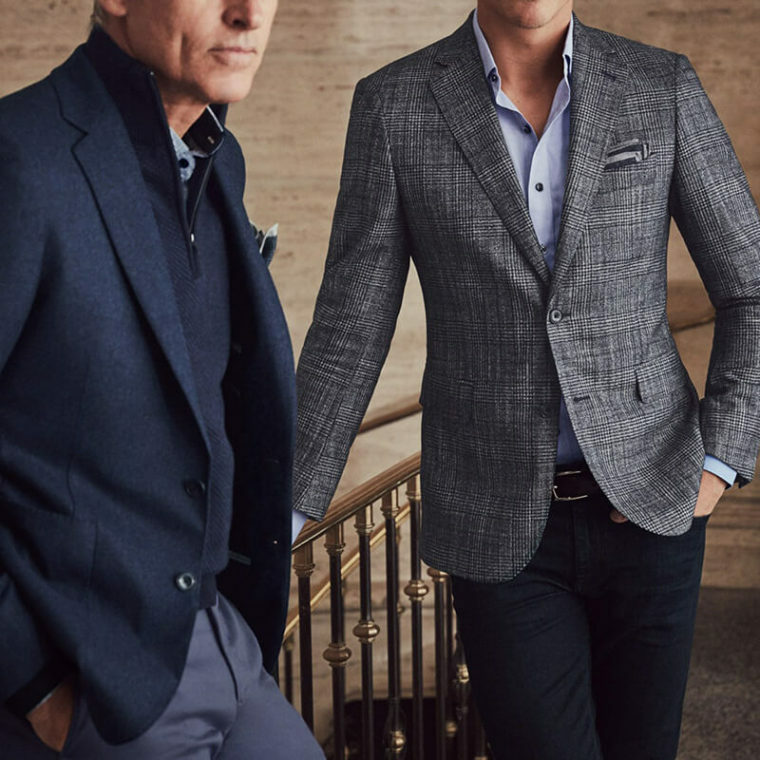 As your personal J.Hilburn stylist, I am happy to help you start building your new neutral wardrobe. If you don’t have a J.Hilburn stylist already, feel free to reach out to me. I’d be happy to walk you through how to wear blue and gray or even come by for a free consultation of your current wardrobe.